The present study aimed to examine the relationship between dietary patterns and breast cancer risk among Chinese women. Four hundred and thirty-eight cases with histologically confirmed primary breast cancer and 438 controls were consecutively recruited. Cases were frequency matched to controls on 5-year age group and rural–urban residence. A validated food frequency questionnaire was used to assess dietary intake by face-to-face interviews. Dietary patterns were identified by factor analysis. Multivariate odds ratios (OR) and 95% confidence interval (CI) were estimated using unconditional logistic regression adjusted for various potential confounders. Two diet patterns were identified: vegetable–fruit–soy–milk–poultry–fish pattern and refined grain–meat–pickle pattern. After adjustment for confounders, a 74% decreased risk was observed among women in the highest quartile of the vegetable–fruit–soy–milk–poultry–fish dietary pattern relative to the lowest quartile (OR = 0.26, 95% CI = 0.17–0.42). The refined grain–meat–pickle pattern was positively associated with breast cancer risk (OR = 2.58, 95% CI = 1.53, 4.34). 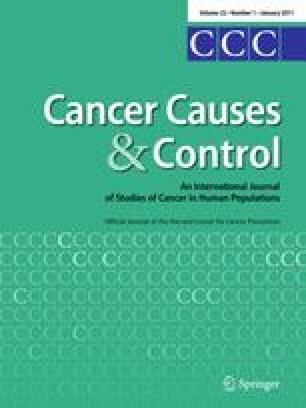 Women with a high intake of the vegetable–fruit–soy–milk–poultry–fish pattern and a low intake of the refined grain–meat–pickle pattern showed a decreased risk of breast cancer (adjusted OR = 0.26, 95% CI = 0.17–0.41). These results indicated that a diet characterized by a high consumption of vegetable/fruit/soy/milk/poultry/fish and a low consumption of refined grain/red meat/pickle is associated with a lower risk of breast cancer in Chinese women. This study was supported by the Centre of Research and Promotion of Women’s Health of the School of Public Health and Primary Care of the Chinese University of Hong Kong. We very gratefully acknowledge the assistance of our student helpers and participation of the study subjects, without them the study would not be possible.